Applications for moving cryogenics liquids from stock storage or from portable Dewar to end use points such as Cold Plates,Test Fixtures, Thermal Shock/Burn-in systems and laboratory Dewar. Our Rmax Insulated Metal Hoses are extremely flexible while maintaining insulation to the transfer media is used in mediaapplications from Semiconductors, Food freezing to autoclave systems. Rmax hoses are insulated with State of the Art insulation material, nanoporous silica which allows for zero-condensationfor applications requiring flexibility at extreme temperatures. 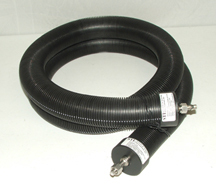 We offer turnkey solutions to the ice buildup and water residue typically associated with Dewar and expensive test equipmentin laboratories, manufacturing and test facilities, not only are our hose insulated but we have reusable coupling covers that slidover hose coupling that go into the equipment. Tapes and foam wrapping are no longer required eliminating the contaminationthat come from these tapes and foam. Are You Looking for an alternative to Vacuum Barrier Cryogenic Flex Lines? - Rmax® Hoses by STI: Systems and Technology International Inc. offer a unique Range to Silica based hydrophobic insulated Hoses. - We custom fabricate for your application needs and Guarantee Zero Ice Build Up on the outside of the hose.